There are a lot of Corvettes for sale every day. A quick search on the internet will reveal hundreds, if not thousands, of Corvettes – from C1’s to C7’s – of varying condition and quality. 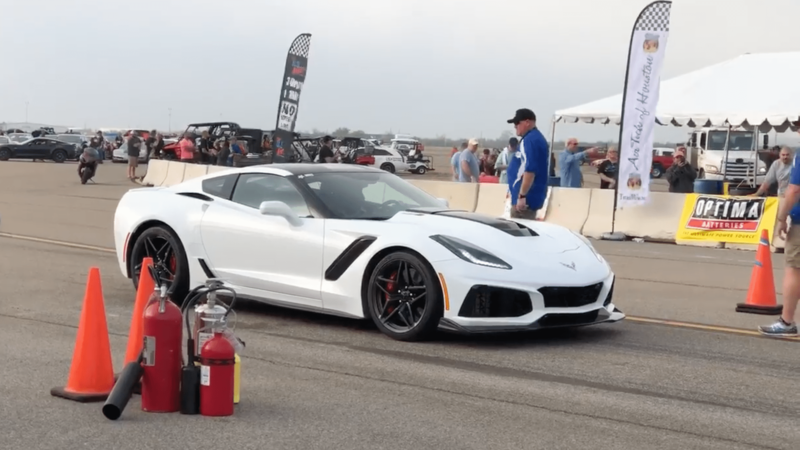 While the newer Corvettes often offer greater performance and handling, the older, classic Corvettes offer styling that is more prominent and dramatic than the brands newer offerings. But what if you could find a Corvette that offered both the technology, power and performance of a modern super car combined with the aesthetic of one of the greatest classic Corvettes ever built? 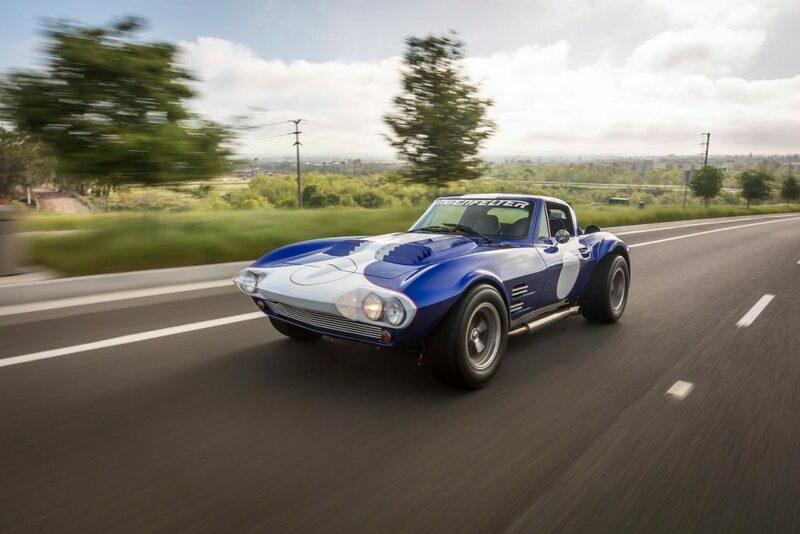 This custom 1963 Corvette Grand Sport by Superformance is currently available on Ebay. Sure, this idea is not new. We’ve uncovered and reported on several custom builds that have combined classic form with contemporary performance. 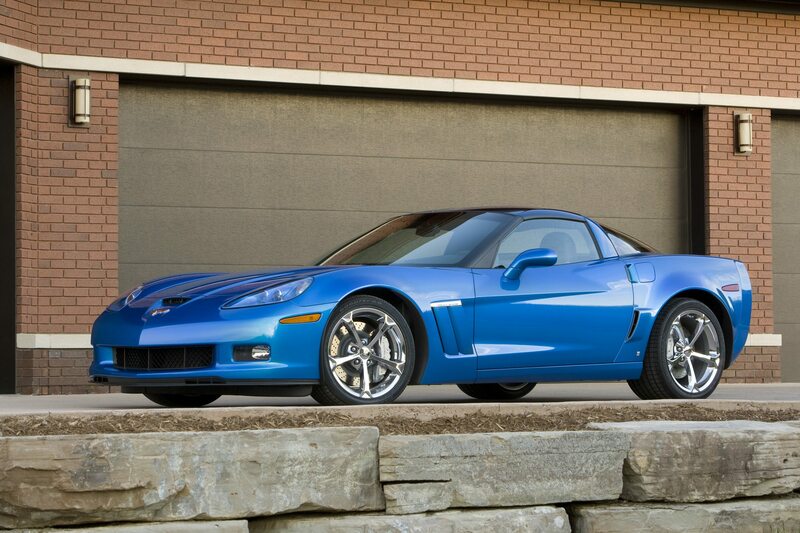 However, we believe we’ve found a custom-built Corvette that really stands out above the rest. This 1963 Corvette Grand Sport is part of the inventory of Hillbank Motor Corporation, a unique dealer/broker of high-end classic American performance muscle and sports cars – and one that specializes in Corvettes, Ford GT-40’s and Shelby Cobras. Located in Irvine, California, just minutes from the John Wayne Airport, Hillbank Motorsports has a showroom of vehicles that’s sure to wow even the most discriminating buyer. And while their primary focus appears to be their vast collection of custom Shelby Cobras, this custom Corvette is something much less common and, in our humble opinion, far more spectacular. Before we even begin, we’ll tell you that this car is priced at $182,240 on Hillbank’s website. It’s slightly less expensive on Ebay with an asking price of $181,999. Yes these are some big sales numbers, but consider everything that is included for that price. First, this is a custom-build, which means that you are investing in a car that will be more unique than just about any other car at your local Cars & Coffee, or even at a national Corvette cruise-in, like the 6th National Corvette Caravan that is slated for August 28-31, 2019. 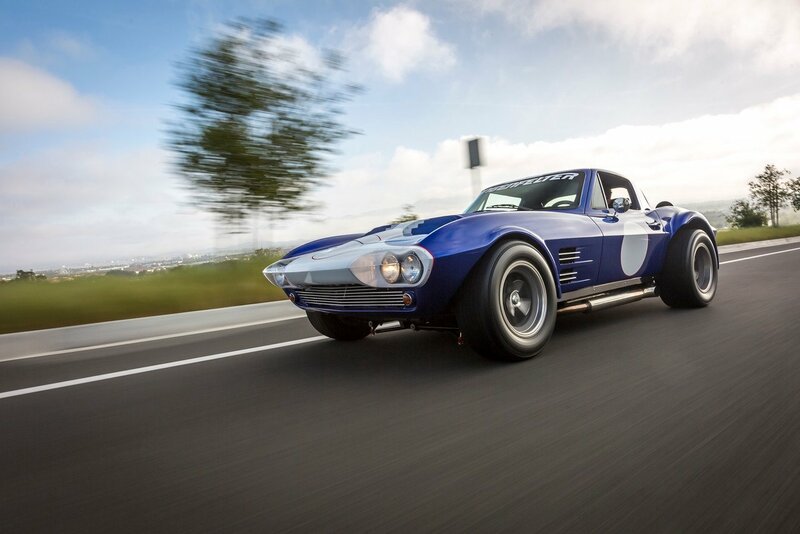 This custom 1963 Corvette Grand Sport is finished in Admiral Blue. 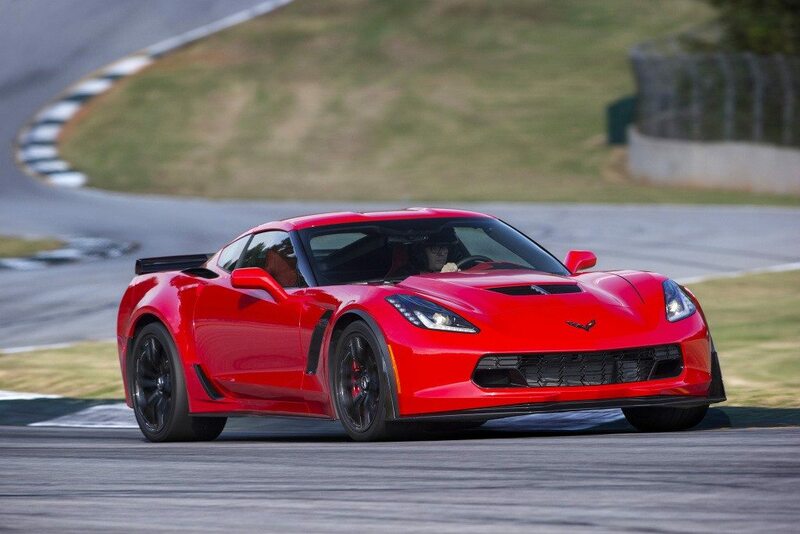 It all starts with an incredibly accurate Corvette Grand Sport rolling chassis. This chassis was built by Superformance LLC, a well-known distributor of complete “rolling chassis” replicas from the 1960’s. Meticulous attention to detail is evident throughout the body fitment, paint and even the smallest elements of the reproduction. Designated model #CGS0021, this Grand Sport chassis alone costs $114,900 from Superformance. The chassis comes finished in the Grand Sport Admiral Blue with the white #2 paint scheme. It features a hand-laminated fiberglass body with reinforcing inserts, rear tail circular cutouts and fender vertical slots, stainless steel side pipes, original 15″ magnesium wheels with AVON tires and original style indicator lenses and headlights. 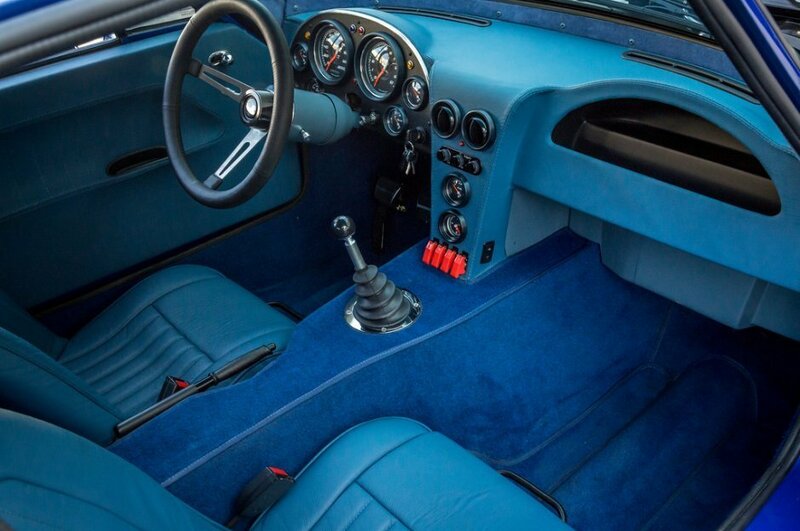 The interior of this custom 1963 Corvette Grand Sport features a touring interior with an adjustable driver’s seat, a carpeted interior, OEM-style pedals and many of the most popular amenities of a modern touring sedan packed into the classic styling of a 60’s-era sports car. Inside, the car features a touring interior finished in blue leather, an adjustable driver’s seat, carpeted interior and trunk, original style pedals, catches, fittings shifter and hand-brake lever, original style latch and lockbolt sets, sun visors with side and rear view mirror and a heater/defogger as well as the optional power windows and air conditioning which were offered by Superformance as part of the build. The car includes tubular steel frame construction for unsurpassed rigidity, fully independent front and rear suspension with half shafts, four-wheel vented disc brakes, custom crafted shocks, an aluminum, single-core, high-performance radiator, shroud and braided lines, an aluminum finished firewall specially designed to better dissipate engine heat, a 17 gallon pressure-tested stainless fuel tank and a Monza-style filler with locking gas cap. 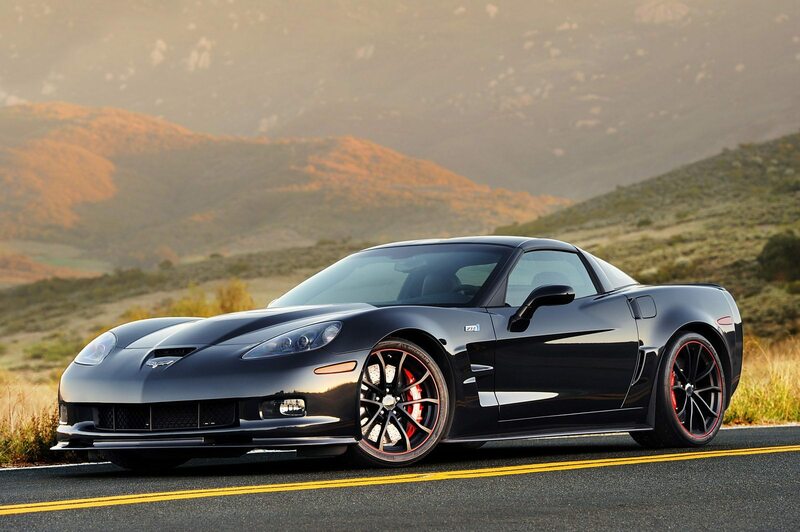 This Lingenfelter LS3 engine features Borla 8-Stack Cross Ram EFI and produces 525 horsepower. The powerplant buried beneath the hood of this car is what brings the whole package together. 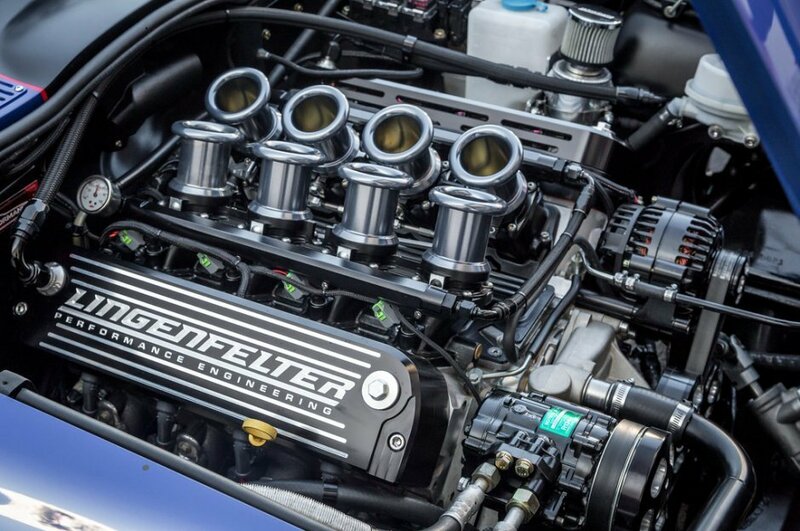 While the car already looks fast, the GM Performance Lingenfelter LS3 engine proves that the car IS fast. The engine is rated at 525 horsepower. It features Borla 8-Stack Cross Ram EFI (Electronic Fuel Injection), stock headers and an optional ceramic coated exhaust that end in stainless steel side pipes. The engine is mated to a Tremec T-56 Magnum 6-speed manual transmission. Unfortunately for us, we don’t live anywhere near Irvine, California, or we’d likely take the time to go and visit Hillbank Motorsports so we could lay eyes on this beauty (and possibly even drive it?) ourselves. Fortunately for us, this car has been test-driven by some of the most reputable automotive magazine editors in the business, and we were lucky enough to find an article originally published by MotorTrend.com that gives us an in-depth review of this car and how it handles and performs. The following are excerpts from an article by Chris Walton which was originally published by MotorTrend in April, 2016. 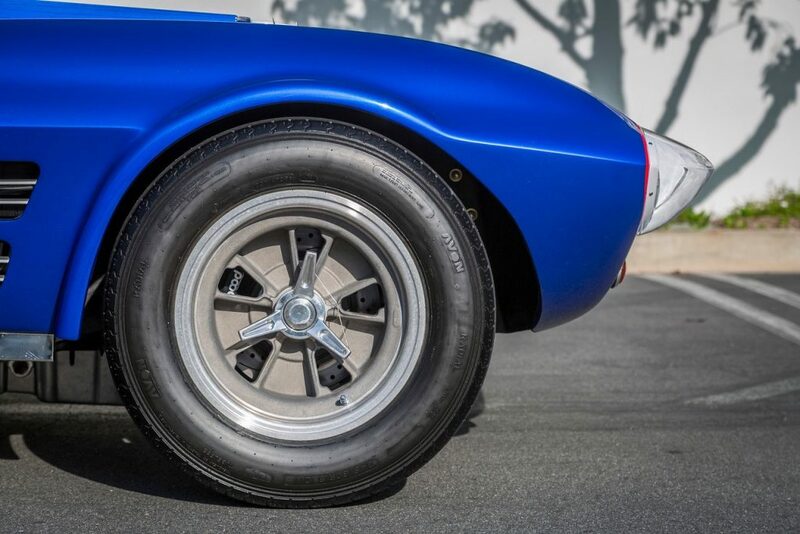 This 1963 Corvette Grand Sport features original 15″ magnesium wheels with AVON tires. Pretty good stuff, right? 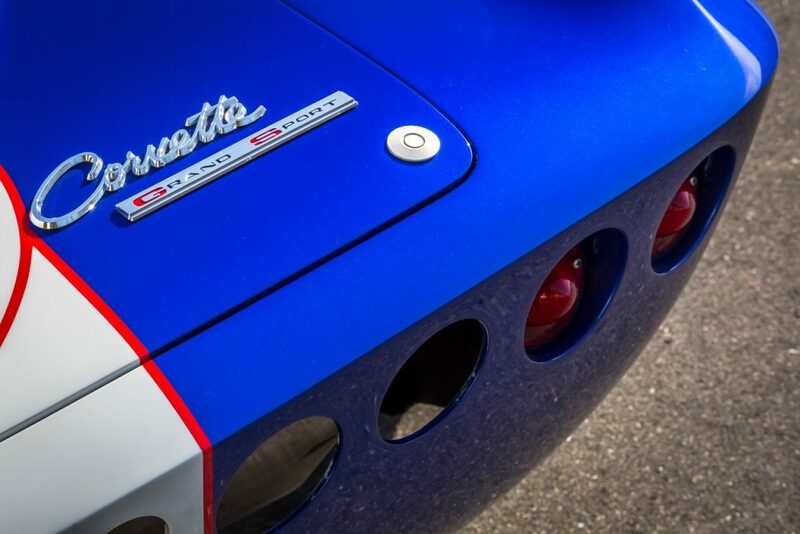 Perhaps this is the biggest value of this car – beyond its handling, beyond its performance, beyond its seemingly near-perfect fusion of classic car with contemporary engineering – what makes this Corvette special is that it is designed so brilliantly to pay fitting homage to the original 1963 Corvette Grand Sport. 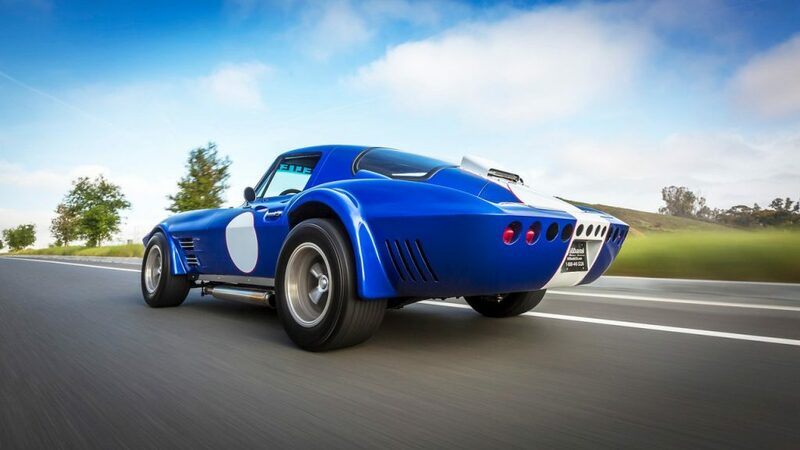 There will be those cynics out there that are likely to dismiss this Grand Sport as nothing more than a “kit car,” but what they will fail to realize is that this “kit car” is about as close as most of us will ever get to driving a real 1963 Corvette Grand Sport….and considering what a real Grand Sport would cost (assuming you’d ever find one for sale) the sticker price on this beauty would like NOT even cover the taxes. As custom Corvettes go, you won’t find much better than this…and for the price, you won’t find much better than this when looking for a car that promises to turn heads without breaking the bank.